Katie and I were inseparable. Neither of us really knew how to be someone’s best friend, but we figured it out as we went. We were roommates, brought together by a mutual friend, and we had only met twice before shacking up with two other girls. I thought she was strange at first: she liked Twilight and never went to bed before dawn. I thought vampires were lame and was always in bed by midnight. She guzzled down litres of cola a week and thought beets only came in a can. I swore off pop in high school and always bought beets by the bunch. But somehow we clicked. We both loved to bake, so we spent hours in our grimy little kitchen, whipping up brownies and cupcakes for our other two roommates. We slowly got to know each other, sharing tidbits of our lives while melting chocolate and sifting flour. We walked arm-in-arm, traded secrets we’d never told anyone before and finished each other’s sentences. We were soul mates. Then one day Katie came in my room, sat on my bed and cried. She wasn’t happy here, she said. She had chosen the wrong degree and was ready to drop out of school. She longed for the comfort of her family and the gentleness of home. She moved out that week. I was okay, really. I had my boyfriend and my kitten, and it was only another two months until I moved back home for the summer. I told her I understood, that she needed to do what was best for her. After a week of baking alone, anger started to set in. I hated her for leaving me, for wrecking what we had. I stopped baking. But every once in a while I would sit in what used to be her room, smelling what was left of her smell, remembering the night her bed broke and she made a tent out of blankets to sleep under. I still loved her, but I didn’t want to. Summer came, and I moved out of the apartment. We sent a few e-mails back and forth, but they were guarded and formal, not like us at all. I thought about her a lot that summer. I regretted a lot of the things I said to her when I was angry, and I was still hurt by some of the things she had said in return. But what we had was special, and I didn’t want to let a difference of opinions tear us apart. I apologized for hurting her, and I finally accepted hers. I still get upset when I think about what happened with me and Katie. Not upset at her, but at the loss of her. It took me a long time to come to terms with the fact that I couldn’t control what she did. It took me even longer to realize that what she did was right. The first time I made these brownies was with Katie. I ate half a dozen of them in the span of an hour, not realizing the effect the instant coffee would have on me until my legs started to jitter and my heart began to race. On that note, eat with discretion. Preheat oven to 350 degrees Fahrenheit. If needed, melt butter slightly in microwave. In large mixing bowl, cream butter, white sugar and brown sugar with hand mixer. Add eggs and vanilla, beating well. Add flour and salt. Extract one cup of mixture and set aside in small mixing bowl. In small saucepan on low heat, gradually melt chocolate, stirring constantly to prevent overheating. Stir melted chocolate into the mixture in the large bowl. Stir instant coffee granules into the batter in the small mixing bowl. Spread chocolate batter into greased baking pan. 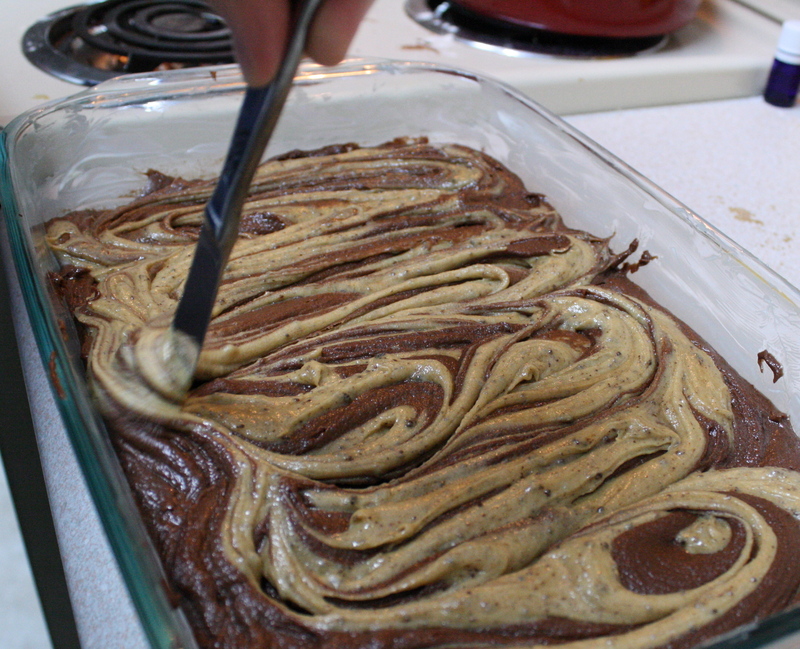 Drop coffee mixture by spoonfuls on top of chocolate batter and swirl with a knife to create a marbled pattern. Bake for 20 to 25 minutes or until a toothpick comes out clean. Cool on wire rack. Sprinkle with icing sugar. I love your stories! 🙂 You are brave to share them.